'Tony Stubbing, an English painter who came to Paris a year ago after many years in Spain, is having his first one-man show in Paris at the Iris Clert Gallery, 3 Rue des Beaux-Arts. This minute and active gallery is indeed a small frame for the large canvases he has been producing, but there is enough here to give us a good idea of his work. - Yvonne Hagen writing in the International Herald Tribune, March 1957. Newton Haydn (Tony) Stubbing was born in England but spent much of his life abroad. Firstly, in the late 1940s and '50s in Spain and France, where he began to develop as an artist; then, in later life, he lived between London and America. His hand-print paintings of the 1950s and '60s were the first to earn him an international reputation - Sir Herbert Read chose one as the final image in his influential book A Concise History of Modern Painting, published in 1960. These atmospheric paintings, often on a large scale, were made with Stubbing's hands 'saturated like a living palette'. His lyrical and rhythmic arrangements of palm prints foreshadowed the recent mud wall-paintings of Richard Long. In 1949, Stubbing had been inspired to paint with his hands after being profoundly affected by the prehistoric cave paintings he saw at Altamira in Spain. His own paintings came to have some of the feeling of ritual and mystery evoked by the art of early man. Stubbing also made sculpture, designed furniture and was an inventor and philosopher. Throughout his painting career he made small landscape sketches and when, in his later work, he returned to painting with brushes, he produced abstracted landscapes of luminous, subtly toned expanses of colour informed by his 'nature note' sketches. Until recently, Stubbing was better known in Europe and the USA, but in the past few years the Tate has acquired two significant works, as have other British collections. In Paris in the 1950s, he showed at the avant-garde Galerie Iris Clert, as did his friend Yves Klein. In America, he exhibited with galleries such as Martha Jackson and Pierre Matisse and he is represented in many American public collections, including the Museum of Modern Art, New York. Other collections that own works by Stubbing include the Museum of Modern Art, Paris; the Museum of Modern Art, Madrid; the Arts Council of Great Britain and the British Museum. Illustrated catalogues available - contact the Gallery for details. Tate, London; British Museum, London; Museum of Modern Art, New York; Modern Art Museum, Munich; Museum of Modern Art, Paris; Museum of Modern Art, Madrid; Westerdahl Museum, Canary Islands; Chicago Art Institute, Illinois; Phoenix Museum, Arizona; Chase Manhattan Bank, New York and London; Weatherspoon Collection, North Carolina; US Steel Corporation, New York; Panoramic mural paintings, Findhorn Foundation, Scotland; Cathedral of St John the Divine, New York; Lindisfarne Fellow's Collection, San Francisco; Seymour Knox Collection, Buffalo; Iowa University Museum Collection; Alvaro Delgado Museum, New Orleans, USA; Guild Hall Collection, East Hampton, NY; Theatre Museum, London (costume & set designs); Arts Council of Great Britain. Stubbing, Circolo de Belles Artes, Santa Cruz de Tenerife (presented by Eduardo Westerdahl). Stubbing: Exposicion de 34 oleos, Gallery of the Museum of Contemporary Arts, Madrid. Stubbing, Gallery Iris Clert, Paris. Stubbing, Gallery Michel Warren, New York. Royal S.Marks Gallery, New York. Manannan's Heritage, mural unveiled at the Casino, Douglas, Isle of Man. Paintings - Tony Stubbing, Queens Square Gallery, Leeds. Pergamon Man, sculpture installed at Pergamon Press Building, Oxford. Kunst und Industrie, Museum of Modern Art, Munich. Art Spectrum, Alexandra Palace, London. Ruth S. Schaffner Gallery, Santa Barbara. Towards Infinity, Richard Demarco Gallery, Edinburgh. Aberdeen Art Gallery & Museum, Scotland. Elaine Benson Gallery, Bridgehampton, USA. Tony Stubbing: Paintings, Hoya Gallery, London. Art and the Sacred, Lindisfarne Fellows Conference, Southampton, New York. Paule Anglim Gallery, San Francisco. Maxwell Davidson Gallery, New York. Paule Anglim Gallery (with Colour Spectrum), San Francisco. Finishing and signing of the Findhorn Murals, Scotland. Elaine Benson Gallery, New York. Last Works, Lindisfarne Fellows Conference, Cathedral of St John the Divine, New York. Haydn Stubbing Studio Exhibition, USA. Cathedral of St John the Divine, New York, dedication by the Lindisfarne Fellows of three paintings for the St James Chapel. N.H.(Tony) Stubbing: Rituals. Paintings and works on paper 1948-1968, England & Co, London. N.H.Stubbing: Hand-print Paintings 1954-1964, England & Co, London. Newton Haydn Stubbing: From Altimira to Sagaponack, Nabi Gallery, Long Island, USA. N.H. (Tony) Stubbing (1921-1983): Retrospective, England & Co, London. Exposicion de Acuarelas, Galeria de Arte Libreria Lino Perez (exhibited as Antonio Estubky). School of Altamira, 1st International Art Congress, Santander, Spain. Salon de los Once, Academia Breve, Galeria Biosca, Genoa. Biennale Hispano Americano, La Havana, Cuba (Paintings and Ceramics). Arte Fantastico, Clan Gallery, Madrid, presented by Antonio Saura. Bocetos para Estampados, Gaston Y. Daniela Ltd, Madrid. Recent Developments in Painting, Arthur Tooth & Son Gallery, London. New Acquisitions, Martha Jackson Gallery, New York. Westerdahl Collection, Municipal Museum of Fine Arts, Tenerife, Canary Islands. Arte Nuova, Turin (curator: Michel Tapie de Celeyran). Westerdahl Collection, Municipal Museum of Fine Arts, Toronto. Moments of Vision, Rome-New York Art Foundation, Rome (presented by Sir Herbert Read). Junger Maler der Gegenwart, Vienna (curator: Julian Alvard). Circa 1959-60 at Stadler Gallery, Paris, and Galerie Rive Droite, Paris. Antagonismes, Musée des Arts Décoratifs, Louvre, Paris. Recent Developments in Painting III, Arthur Tooth & Son Gallery, London. Royal S. Marks Gallery, New York. Rome-New York Art Foundation, Rome, presented by Sir Herbert Read. Recent Developments in Painting V, Arthur Tooth & Son Gallery, London. Contradictions, McRoberts and Tunnard Gallery, London. Techniques, Camden Arts Centre, London. 8 Peintres, Salines Royales, D'Arc et Senans, France. Without Brushes, Pierre Matisse Gallery, Boston. McRoberts & Tunnard Gallery, London. Ballet Designs for Saeta, Wright Hepburn Gallery, London. The English Landscape Tradition into the 20th Century, Camden Arts Centre, London. Neue Tendenz, Museum of Modern Art, Munich. Manufactured Art, Camden Art Centre, London. Hampton Landscapes, Elaine Benson Gallery, Bridgehampton, USA. Artists of the Region, Guild Hall, East Hampton, New York. The Laundry Gallery, East Hampton, USA. The Ingbar Gallery, New York. New Acquisitions, Tate Gallery, London. Old Friends, Elaine Benson Gallery, Bridgehampton, USA. Camberwell Students 1940-1960, Belgrave Gallery, London. Drawing on the East End 1940-1988, The Parrish Art Museum, Southampton, USA. New Acquisition, Guild Hall, East Hampton, New York. Art 95, London Contemporary Art Fair (England & Co). Identita e Alterita, Venice Biennale, Italy. Nocturnes, Nabi Gallery, Long Island, USA. Continuation, England & Co, London. Talking of Yves, England & Co, London. Born London, 12 February. Early childhood in Battersea, and then Hertfordshire, where he learned country lore and the art of observing game from a gypsy who worked for his family - a life-long influence. School at Uppingham in Rutland, where he won his first art prize. In his free time he learned the art of taxidermy from the 'Omaha Nebraska School of Taxidermy by Correspondence'. Newfoundland ornithology expedition with Royal Geographic Society. Army service Kent Yeomanry, Royal Artillery. On loan as ADC to Montgomery for three months. Stationed in Iceland for 18 months. Painted in spare time, influenced by Icelandic painter Kjarval. With his regiment in Cairo. Painted and sketched, as he did throughout the war. Sent to Cyprus, where he had first one-man show. Into heavy action in Italy, where he sketched enemy positions while an observation officer. Returned to Britain for pilot training. Back to Italy for duty, when war ended in Japan. With 654 Squadron RAF, he was made pilot to a general. Visited museums, played polo and sketched on his leave periods. Demobbed from Army. Returned to work for a short time in father's business. Attended night classes at Camberwell School of Art for eight months. Studied with Sir William Coldstream, William Johnstone, and briefly with Victor Pasmore. Left England for Spain where he furthered his study of painting as a copyist at the Prado Museum. Did series of portrait sketches and paintings at the Madrid Hospital for the Insane. Exhibited traditional landscapes and portraits at the British Institute. Charter member of 'School of Altamira'. Idea for the movement was proposed by Mathias Goeritz, painter, and named by Angel Ferrant, sculptor. The first meeting was held in the caves near Santillana del Mar. Altimira was a key event for Stubbing, bringing his belief in the importance of primal elements in art into focus. At Altimira he met Eduardo Westerdahl, the critic and museum director, who became his supporter. Under the tutelage of master-potter Laurenz Artigas (who produced the now famous series of vases and sculpture with Miró), Stubbing began a period of sculpture and ceramics. Worked as a night-watchman at the British Embassy in Madrid from 1948 to 1953 to support himself as an artist, sharing the job so that he had three weeks working and three weeks off. He spent his free periods camping in the Sierra mountains where he would paint, sculpt (keeping his stones in the river like prehistoric man) and write poetry. He also was making delicate twig sculptures from materials he gathered in the mountains. About this time he was working on a series of collage poems (a method he returned to later in life). He married his first wife, a Madrid journalist's daughter, Rosa Marie Garcia Diaz and lived with her in a flat on the outskirts of Madrid. Exhibition of his new work in Madrid. Corresponded with Bernard Leach about making ceramics. Stubbing began to attract collectors, mainly Americans visiting Spain, including Bill Davis, a friend of Ernest Hemingway and early supporter of Jackson Pollock. His career as a contemporary painter developed, and he began to evolve his distinct hand-paint style inspired by cave drawings and paintings. Initially Stubbing used his right hand alone, but began to use both hands from about 1957. 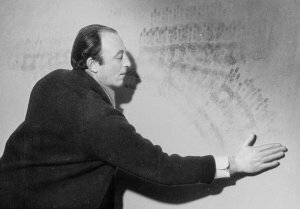 Stubbing moved to Paris, as had several of his Spanish artist friends like Antonio Lago and Aguayo. He found studio accommodation at 13 Rue Duroc in the 7th arrondissment, and supported himself with occasional jobs such as carpentry and house-painting. Designed decor and costumes for the ballet Saetta; and for the ballet Song of Eternal Sorrow for the Marquis de Cuevas Ballet Company, commissioned by their choreographer Ana Ricarda who he had met earlier in Spain through their mutual friend Antonio Chapa. At the same time he worked on series of hand-paintings for his forthcoming exhibition. First one-man show in Paris at Galerie Iris Clert brought him in contact with Yves Klein and the volatile Paris avant-garde scene in which he was soon immersed. He was on friendly terms with many of the artists in Paris, including Paul Jenkins, Riopelle, Joan Mitchell and Sam Francis; but preferred to visit museums rather than the studios of his contemporaries. Agreed to a divorce from Rosa Maria - their relationship had deteriorated while he was away in Paris. The next years resulted in a solid body of work executed in the direct hand to canvas method, in a series he called Rituals. His career began to flourish in London and in New York as well as Paris. He made his first visit to New York in 1958 (and had his first one-man exhibition there in 1960). He decided to stay on, although he kept his Paris studio. When Yves Klein visited from Paris, Stubbing showed him round New York. Ana Ricarda (who he married in 1963) was planning a ballet based on American Indian legends. She and Stubbing travelled to California to visit Indian sites. It was while collaborating on this research that Stubbing came across the 'Trickster' legends of the Winnebago Indians - these legends fascinated him and influenced his next body of work. New York became a serious base with a studio in an empty building on Front Street next to the Fulton Street market. In 1962, he worked in the Minimal style of the day, each canvas becoming an ode to a single colour, still painted with his hands. A difficult break in 1963 with his current N.Y. gallery (Royal S. Marks) brought him back to London and the Continent, where he was to remain and work for the next 10 years. Years of commissions for murals brought a large scale to many works that dramatised a private mythology of symbols gathered from early cultures and rites. He terminated his period of colour-field painting and his hands returned to a more vigorous and graphic display as he began to employ these signs and pictograms, In 1967, he completed the mural Manannans Heritage for the Isle of Man Casino. From about the mid-1960s, Stubbing used a barn at his parents' home in Kent as a studio, travelling from the small house in Knightsbridge he shared with his wife. After his father's death in 1967 he had to give up the barn, and established a studio on the top floor of a family-owned house in Brendon Street, near Lisson Grove in London. Passing through London in 1967 on her way to take up a museum job in Germany, Yvonne Hagen (an art critic and curator, who had first met Stubbing in Paris in the 1950s), visited Stubbing at his studio. This visit renewed their friendship and led to her helping him with exhibitions and projects in Munich. His health deteriorated after 1966 and an allergy to paints was suspected. By 1968 he was advised to stop painting with his hands. A return to sculpture developed into a strong period of creativity. He executed a stone sculpture for Pergamon Press, Oxford, and also made designs for the Royal Ballet School, London, including costumes for the ballet Divertimento Espagnol choreographed by Ana Ricarda. He took up the flamenco guitar and learned to play it well - another thoroughly executed interest. He began painting again full time after a three-year respite, now with brushes. A separation from his wife ended in divorce some time later. Journeys to America began again each year with exhibits of his new work on the West Coast. From 1973, a transatlantic yearly migration to Long Island was established with Yvonne Hagen. He made a studio in a barn by her house on Long Island, and worked around this time on a series of hand-painted postcards, producing several thousand of them over the years His paintings of this period, light-suffused abstracted landscapes, suggested infinite space, with the horizon line placed to achieve a balance between land, sea and sky. Voted Fellow of Lindisfarne Foundation, a cultural think-tank founded by Professor William Irwin Thompson, with approximately 30 experts in religion, science, philosophy and the arts. Stubbing had met Thompson at the Foundation at Fish Cove on eastern Long Island, and attended lectures and gatherings. Following a trip to the Austrian Alps in the summer, he began a series of 'mountain' paintings. In the summer he spent two months as artist in residence with the Lindisfarne Foundation on the St Louis Valley Plateau at Crestone. Completed his Findhorn Murals (for the Lindisfarne Foundation) which he had been working on over a five-year period on visits to Scotland. Travelled in Spain in the summer with Yvonne Hagen and the American art historian Robert Hobbs (who was researching the School of Altimira for Cornell University). Married Yvonne Hagen in Bridgehampton, Long Island, before they returned to London, where he died in October. The Tate Gallery, London acquired his painting First Ritual 'Christian' (1958). The British Museum purchased a group of early works on paper from the first exhibition at England & Co, London. The Arts Council of Great Britain acquired an untitled hand-painting from 1956. The Tate Gallery acquired his large painting Coral Variations (1954). Tony Stubbing in Paris, 1960.